At some point in school everyone learns some basic geometry. For instance, a triangle is an object with three sides. You can measure each side of a triangle, add it together, and get the perimeter. If you multiply the base by the height and divide by two, you get the area. And in high school you get to prove why this is true. And this sort of thing holds for all Euclidean geometry (Euclid was that Greek guy a long time ago who first put all of this into a system). The only problem is that none of these shapes actually exist in the world. If I asked you to measure the perimeter of the little island in the middle of the pond at Camp Trinity, you’d have a much more difficult time than with a triangle. There are all these little nooks and crannies on the outside, and the closer you look at it, the more things you have to measure. This is the strange and wonderful world of fractal geometry, where some interesting and sometimes paradoxical things happen. Take, for instance, the Koch snowflake. 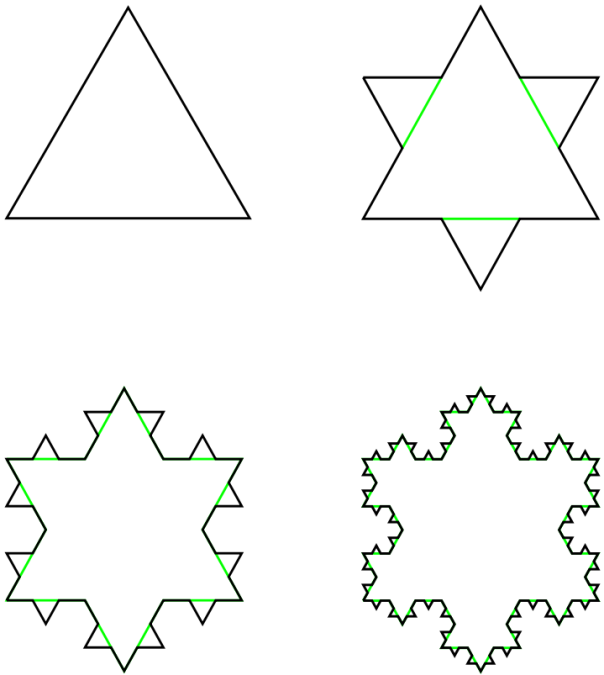 This is constructed by taking a regular triangle, and extending another triangle off of each side, so that it looks like the Star of David. Then you do the same thing for each of the sides of the new triangles, and then again and again. It starts to look like a snowflake. The paradox is that its area is finite, but its perimeter is infinitely long. So if you started tracing the figure at one corner, you’d never be able to trace all around it. The closer you look, the more you have to trace. This is the curious thing that happens with Elijah, though not with a geometric figure. His prophetic ministry coincides with a severe famine. God first preserves him by a hidden brook and sends ravens with food for him. But after the brook dries up, he is sent to Zarephath to a widow and her son, who have one meal left. Listen again. She went and did what Elijah told her, and so she, he, and her family ate for a long while. The jar of flour never got empty, and the jug never lacked olive oil, as the LORD had promised by Elijah. Now this is pretty cool. It’s not that new flour and oil suddenly blinked into existence, but that the closer she looked, the more there was. It’s important to remember that God’s miraculous gift shouldn’t be limited to the abundance of flour and oil, but also to its scarcity. The final measure of flour and oil, which the woman had by natural means, is as much a gift of God as the multiplied flour and oil—and as much of a miracle. The fact that you have flour in your cupboard is a gift of God, and miraculous that it’s there. It’s also miraculous that flour does its thing when you make pancakes, or a rustic loaf of bread, or a béchamel sauce. But not only do we tend to overlook the miraculous of the everyday, we also tend to consider God’s gifts insufficient at first glance. This is why stewardship is so poor in LCMS congregations. I heard this week a statistic that the average LCMS giver gives 2% of their income. That’s a bit shy of the 10% standard established in the Old Testament (although if you count up all of the tithes required of God’s people in the Old Testament, it works out to more like 30% of your income goes to the Church. Go home and do that calculation, and give thanks to God that you live in the New Testament dispensation of grace). But stewardship of God’s gifts is not a zero-sum game. It’s not that in order to give more, you have to make do with less. The more the widow gave, the more she had. 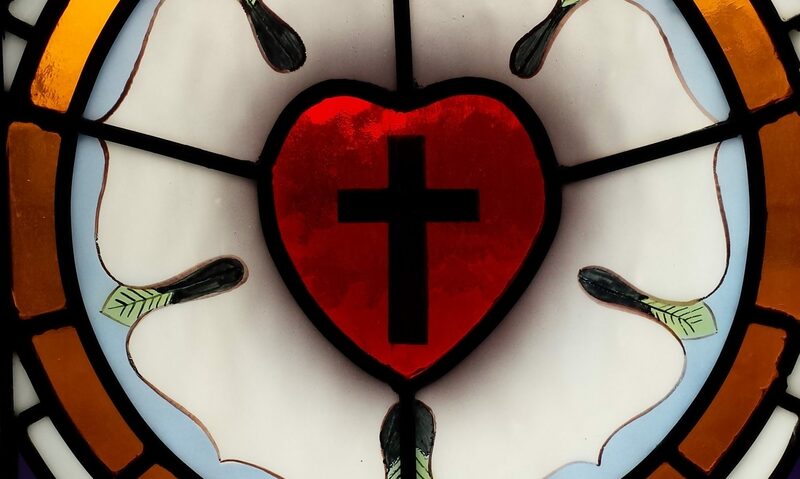 As Jesus said, “To the one who has, more will be given, but to the one who has not, even what he has will be taken away.” At first glance God’s gift may look insufficient, but the problem is not with the gift—it’s the way we look at the gift. And because we don’t look properly, we lose trust in God to provide. It’s a First Commandment problem—we do not fear, love, and trust in God above all things. In fractal geometry, if you put the figure under the microscope, more and more opens up. But that’s not how the gift of God works. It doesn’t reveal its abundance under scientific investigation. The gift of God needs a different kind of investigation. But, if you take a closer look at God’s gift, you’ll find everything that you need. The view of God’s gift demonstrated by the widow of Zarephath was the view of faith. And that’s not predominantly a vision of the eyes, but of the ears. The prophet, the man of God, spoke God’s Word: the flour and oil would never be empty. God would provide. And every time she looked, she found more. An optimist sees the cup as half full; a pessimist sees it half empty. But faith sees that it’s all that you need to support this body and life. And then some. That’s the way God gives gifts. Good measure, shaken together, pressed down, and overflowing. He gives and gives and gives until He can’t give any more and then He gives some more. Our God is superabundantly generous with His grace. Take a look at the Lord’s Supper. Just bread and wine. Kind of a plain meal, and certainly not enough to hold you through the rest of the day, much less till lunch. And if you were to put it under the microscope, you’d find tinier and tinier bits of bread or drops of wine. But, if you investigate according to your ears, you hear, “This is My body; this is My blood.” The closer you look, the more you have.